Sea anglers are seeing the social and economic benefits of their sport recognised for the first time. Countryside Minister Elliot Morley supports the proposed Cumbrian livebait ban. Official announcement expected soon. 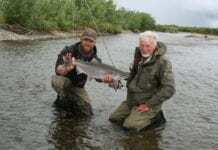 Spend time on the bank with four-times world champion Bob Nudd at one of his favourite waters. Today's deal of the day from Sportfish is one of the all-time carp bait classics! A popular young man wins his club's 'Angler of the Year' award. Home International success for England Youth in Ireland. The Angling Trust is seeking a new Chairman to lead the board of the organisation and oversee its continued development and expansion as the National Governing Body and unified representative organisation for coarse, game and sea angling in England. Temple catches go off 'Richter Scale' with sixteen 30's banked over the weekend and still counting!